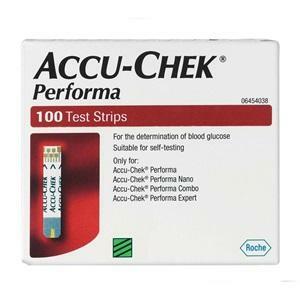 Accu-Chek Performa test strips are part of the system that carries out intelligent safety checks. The test strip electrodes work with the system technology and code key to perform extensive quality checks such as strip integrity checks prior to each test - so fast you do not even realise it. Expiry warning. The test strip expiry warning offers additional convenience and safety. Temperature and humidity compensation. The Accu-Chek Performa test strip adjusts to heat, cold and humidity to ensure accurate measuring. Tiny blood sample. Accu-Chek Performa test strips only require a tiny 0.6 micro litre sample for a blood glucose measurement. This makes lancing less painful as you can use a lower penetration depth. Furthermore, a smaller blood sample reduces the likelihood of under-dosing. Re-dosing capability. The system indicates if more blood is needed and permits re-dosing within 5 seconds. Fast capillary fill. The strip uses a super-fast-fill capillary window which acts like a funnel to help draw blood into the strip quickly, making dosing more convenient for the user. Y-capillary. The strips wide Y-capillary allows easier targeting of the sample, which is particularly important for patients with dexterity problems. Advice: When you take a test strip from the vial make sure you close it immediately afterwards to preserve strip quality.